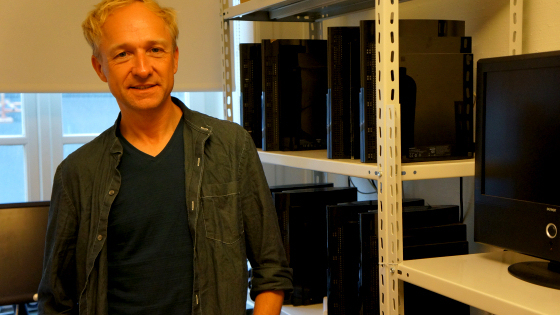 Lars Hård is a self-taught coder who learnt as much as he could about the cell processor and built network clusters out of PS3 units. He once created the soundtrack for a game using only 70 bytes. 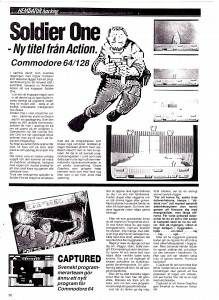 Nowadays, the computer rebel runs a IT company in Silicon Valley that focuses on artificial intelligence, but he’s probably most known as the founder of Greve Graphics – Sweden’s first video game developer. This is an English translation of an original post in Swedish. 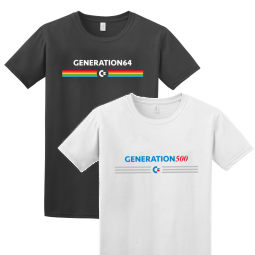 And for some, the name Greve Graphics is more than enough to create vivid memories of a long lost computer and gaming age. 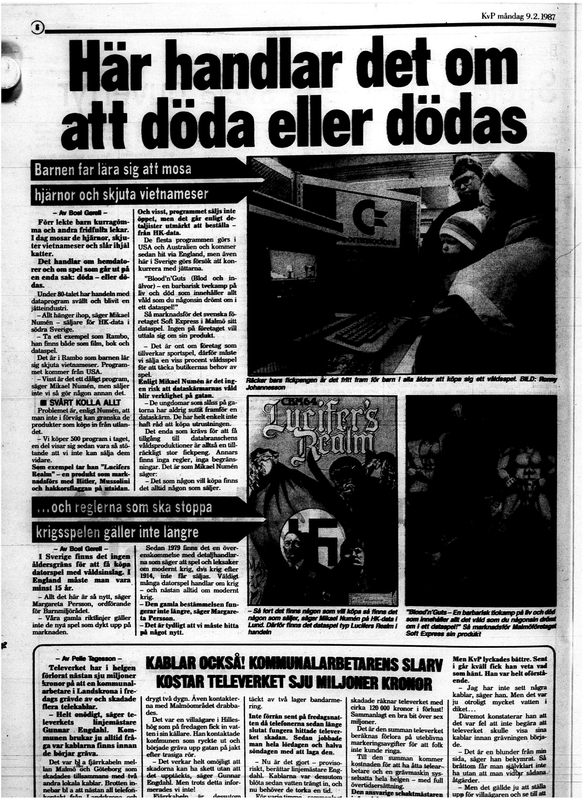 To be honest, I’m surprised that more people haven’t written about “GG” (as the company was known in the inner circles of yesteryear), seeing as they were Scandinavia’s first game developer. They created blockbusters and scandalous games, and are still a hot topic in the retro gaming scene seeing as their last game Goremium never actually got released. 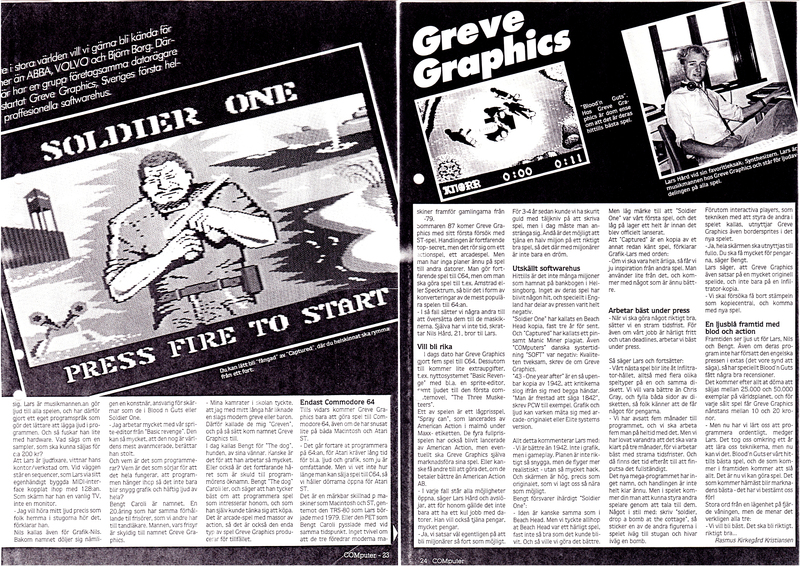 Greve Graphics are most known for the alternative sporting game Blood and Guts from 1986, which could be described as Summer Games with a Nordic twist. 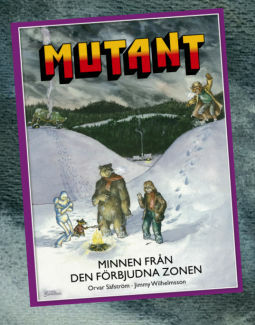 The name itself had little to do with the content, even though the pixelated characters did fight one another and threw their fair share of axes (and even cats). Blood and Guts was released in 1986, just before the holiday season. 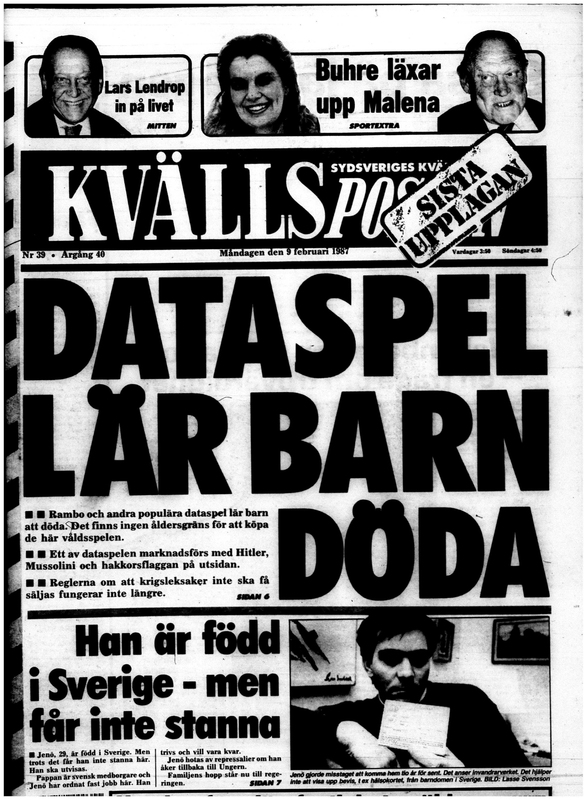 During this time Sweden was in the middle of its own video nasty debate, and in February of 1987 the newspaper Kvällsposten ran a critical article based on the game’s name. These facts are well-established and can be found elsewhere on the internet, but what happened to Greve Graphics afterwards? And what’s up with all the die-hard rumours about their unreleased game Goremium? 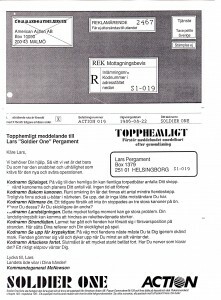 I decided to find one of the co-founders Lars Hård and get some answers. My search first took me to Ideon Science Park in Lund, and then onwards to Hård’s development office in Malmö. 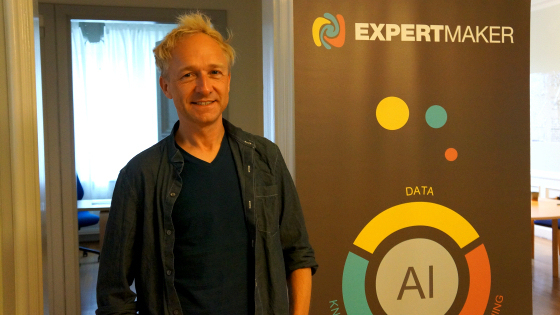 Today, Lars Hård runs the AI company ExpertMaker. 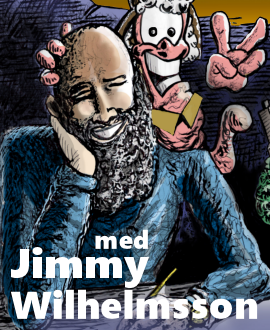 Lars Hård founded Greve Graphics in the autumn of 1983 with his brother Nils Hård and their friend Bengt Caroli. During that time, they were students at Lund University. 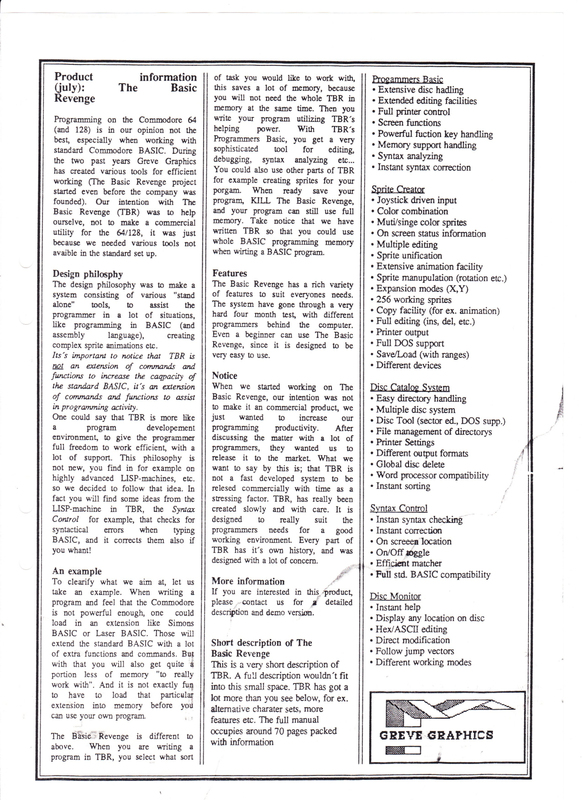 Computer related jobs in the early 80’s usually meant working with administrative systems, which none of the young men were interested in. They didn’t really want to finish their university studies either, as newly started game companies such as U.S. Gold and Gremlin Graphics seemed much more interesting. And the trio wanted to make their own games. 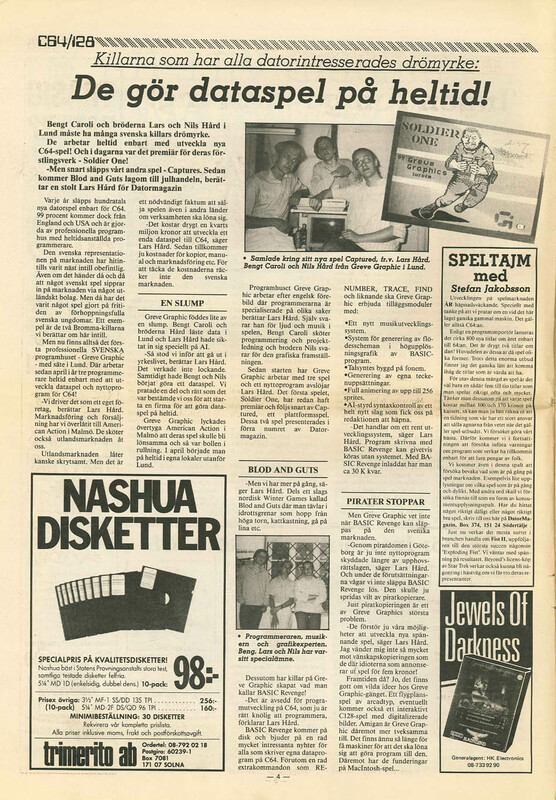 In 1983 there weren’t any game companies at all in Sweden. England and the US had an abundance of them though, and we thought to ourselves “If they can do it, then why can’t we?”. Today it’s clear that our motivation came from the fact that we just were tired of school and didn’t want a regular job with computers. The simple fact that we didn’t have anyone to take after or turn to for advice led to us running the company in a naive way, which meant that we hardly had any money in the beginning and mainly played games. So how did you finance the company in the beginning? What was your plan? And what was your business plan? I guess you could say that our business plan was to not have a business plan. I remember going to the bank to get a start-up loan, and they couldn’t understand anything about what we wanted to do. They straight up asked us if we thought that they would give us money to play games all day long. [laughs] The thing is that we wanted a fun job, and we arranged several large parties, or vernissages as we used to call them. Loads of people attended them, and we even had visitors from abroad and people attending that we didn’t know. 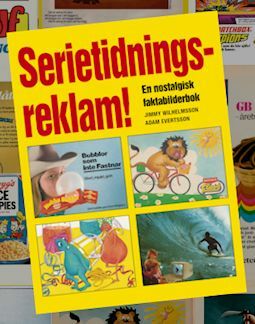 Swedish computer magazines really wanted some Swedish games. Bengt Caroli’s home in central Lund was used as Greve Graphics’ first office, but they soon moved to the second floor of Prästgatan 24 in Helsingborg. Bengt Caroli apparently ”looked like a count with the way he dressed and his strange hairdo”, which resulted in the nickname “Greven” (The Count, in Swedish). The Graphics part was inspired by Gremlin Graphics from England, as they thought it “sounded cool”. Greve Graphics was almost run as if it was a hippie collective, and since we mainly wanted to have fun we didn’t have very high ambitions for the company itself. I guess we were a by-product of the seventies, because we didn’t feel that everything had to revolve around money. We loved computers, but there were only administrative computer jobs out there. That’s why we left school and put everything into Greve Graphics. So how did you make any games if you didn’t focus on work? The infamous draft letter for Soldier One. It didn’t take long until we came into contact with the Swedish game distributor American Action, a completely Swedish company based in Malmö. Claes Magnusson and Philip Diab were two of the main people there. They turned several of our ideas into products and marketed them. 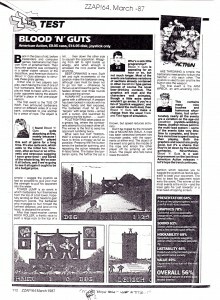 For example, they infamously sent draft letters to young men before the release of Soldier One, which was our first game. All this was very new to us. First of all, we had to decide if we should develop something innovative or just improve on existing genres. And second of all, we had to get paid, which was new territory for us. I remember getting a cash advance when a game was ready for release, and after that we got bulk payments depending on how well it sold. Is there anything that can be said about Blood and Guts that hasn’t been mentioned in previous interviews? We made quite a few games in 1986, and there was a lot of commotion when Blood and Guts was released just in time for Christmas. 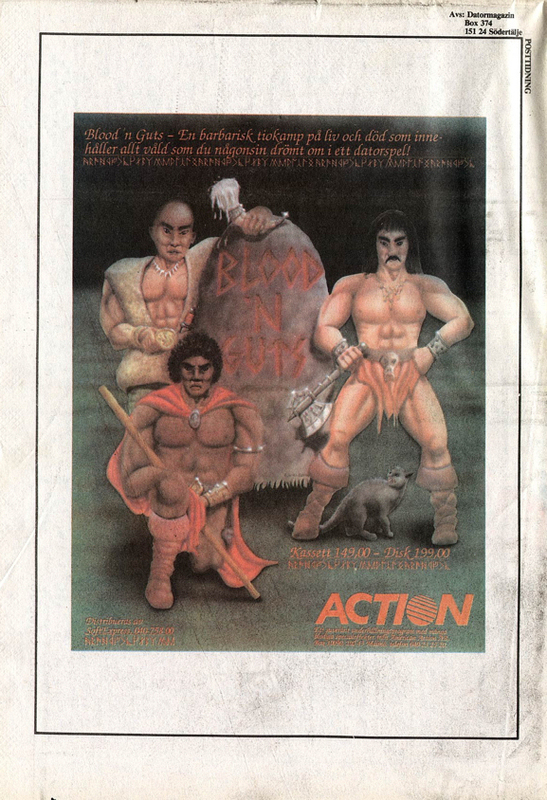 An article in the newspaper Kvällsposten had a picture of Blood & Guts, and indirectly accused us and the game as being a killing manual for children. They reacted the title itself and the game’s advertising campaign, but the only thing this really did was kickstart our sales. I remember that we weren’t ready for this debate at all. We’d been in the Danish press before, but that coverage was more about us having dream jobs rather than violence in video games. We seldom gave any responses to these complaints, which might have been a mistake from a business point of view. I guess it would have been beneficial to put a stop to the debate, as it mainly consisted of pure speculation and uninformed opinions. Did you get similar media reactions abroad as well? I think they were a bit more used to these kinds of things in England, which was the main market at that time. The press mainly focused on the Viking parts, which actually was our main goal. We wanted to make fighting games more fun, and that’s why Blood and Guts was a two player game. We hoped to get attention abroad by using a Viking theme, and it really struck a chord with the English gaming magazines. During one of our interviews we kind of went nuts and said that all the events – from cat throwing to diving into the ground from 20 feet – actually were historically correct Viking traditions. “Did Vikings really do things like that?” they asked. And we just said yes. You also released a game called 1943, just before Capcom released their own sequel to 1942. Their game was also called 1943. How did this happen? Copyright laws back then weren’t as crazy as they are today, so Capcom hadn’t claimed the name 1943 yet. So we just developed our own game and released it as 1943: One Year After. 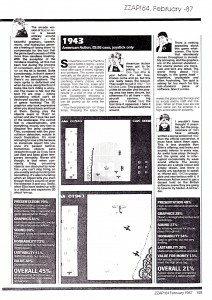 Shortly thereafter, Capcom released 1943: The Battle of Midway. I remember that we wanted to have more bullets on the screen than them, which meant that we had to reprogram everything when we were almost done. Anyway, the result was loads of bullets on the screen at once, but that left no memory for the music or sound effects. That seemed to happen a lot back in those days. How did you solve that issue? I had 70 bytes left over after all the optimisation was done, which is an extremely small amount of data [for example, this text in italic is 70 bytes, including the brackets] and I had to take a radical approach to even get the monotone loop into the final game. I think that all the sounds in 1942 took up 130 bytes in total, which is insane when you think about it. But these limits were also what turned people into skilled coders back in those days. 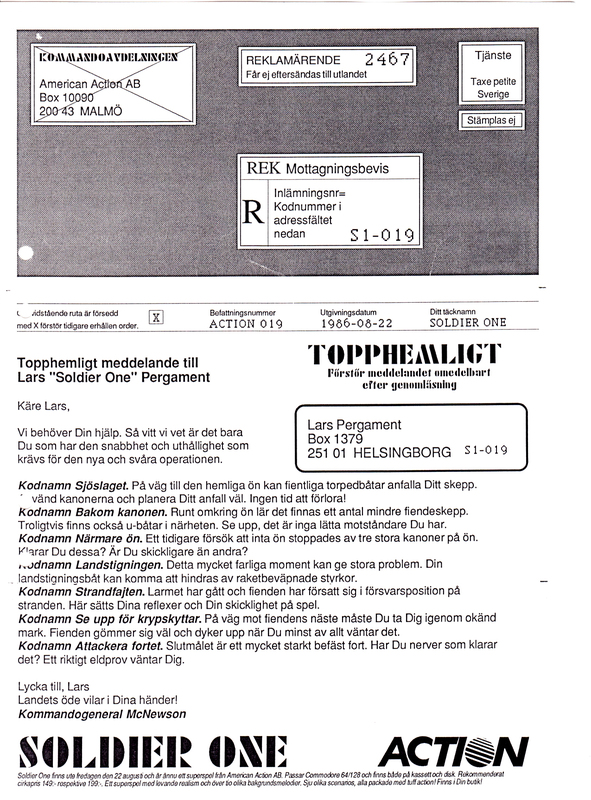 Lars Hård has mainly been credited as Greve Graphics’ composer, but he’s actually been a good programmer ever since he was a kid. Today Lars heads up the AI company Expertmaker in Malmö, Lund and Silicon Valley, with about 20 employees. And he credits all of his successes to the skills he learnt on home computers during his youth. 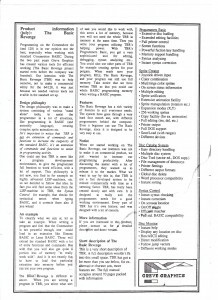 I learnt how to program when I was 12 years old on computers such as AIM-65, ZX80, TRS-80, VIC-20, and C64. I’m completely self-taught and started with assembler, or machine code – i.e. programming directly into the computer without using a high-level assembler. Learning assembler programming gave me an extreme advantage, as I quickly understood what made the computer slow down and how I could stop that from happening. 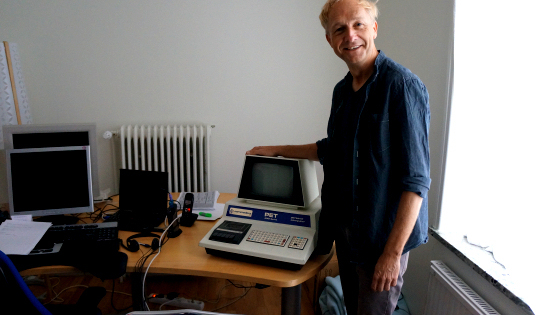 The PET 2001, Lars Hård’s old Commodore computer, can be found tucked away in the office. Lars Hård holds minimalism in high regard when it comes to all kinds of success. Limitations breed creativity, and this creativity is easily lost when there are too many possibilities at hand. Hård agrees that the 80’s was a time when most of the video game genres were created, and what we call indie games today was just the industry norm back then. Today’s indie scene is liberating, especially on mobile platforms as they still have some limitations. I always try to find the balance between playability and the graphic design, because if the latter takes over you can easily lose focus. If you manage to find this balance you can create any kind of game. 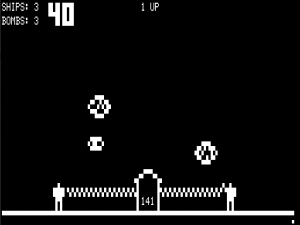 I remember a game for the TRS-80 called Outhouse, in which you needed to protect your toilet paper. I remember it being a very fun game to play. What about the critics that said that Greve Graphics didn’t create very innovative games? 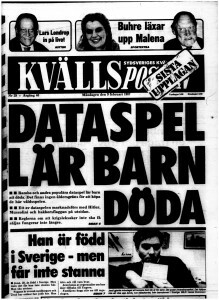 Don’t forget that there weren’t any other game companies in Sweden when we started out. Seeing as we didn’t want regular jobs, our only chance of having fun was to start our own company. We had a lot of pressure in the beginning to actually complete games, but we did work with a lot of innovative products in the background. The plan was to release them when we were happy with them, but most of them were never completed. One side product that we actually did release was The BASIC Revenge, which was an improved programming language for the C64 that was well ahead of its time. Lars Hård, who by this time already had put his university studies behind him, had taken on artificial intelligence as his area of expertise. He favoured the DWIM (Do What I Mean Not What I Type) method, which was popular in computers running the classic AI programming language LISP. Is minimalism something you think about today as well, now that every computer generation clearly outclasses the previous one? Absolutely. To me, minimalism and sustainability are interconnected. Why should we waste power and resources when we don’t have to? When we started Expertmaker around 2006, one of our data clusters was made up of several of the newly released PlayStation 3. We could run Linux on them before Sony imposed their software limitation, and managed to get almost 160 gigaflops per machine. This gave us a lot of capacity at a very low cost. We bought all the PS3 units we could find for a while, starting at the Lekia shop in Lund before buying lots of second hand units. I also found out everything I could about the cell processor, and I still think that the PS3 is very powerful machine that hardly any developer has managed to completely harness. The PS3 has quite bad memory handling, but since we’ve always made a point of optimising our output we’ve been able to work around this problem. The server room still houses a few PS3 units, each outputting up to 160 gigaflops. And what about your mythical and unreleased game Goremium, that was supposed to have unrivalled AI? Yes, we worked on Goremium quite a lot in 1987. 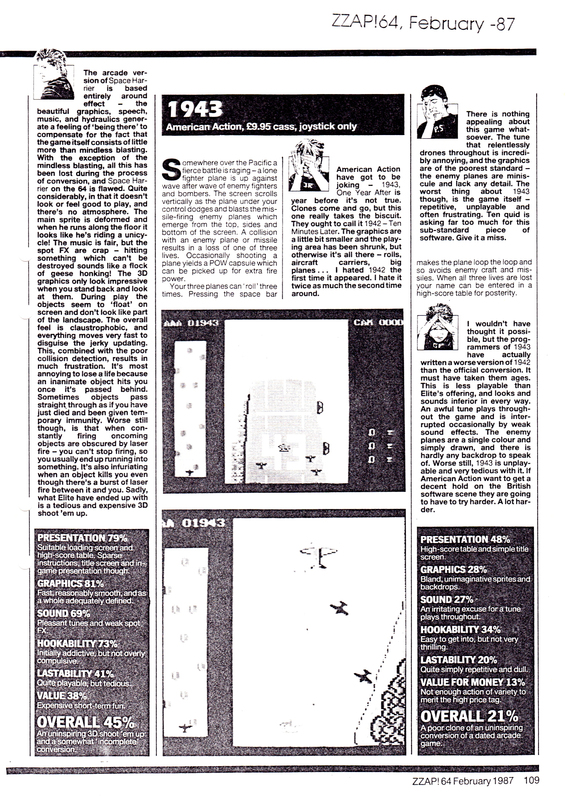 It’s a two player game with quite heavy AI requirements, which is unusual for a C64 game. It’s basically a space shooter where the players can upgrade their ships and rebuild them in order to make them more powerful. The game was very graphics heavy, giving us 48 simultaneous on-screen sprites, but the main idea was to use advanced AI to enable automated team handling. Unfortunately, Goremium never got completed, and by that time we’d grown tired of the game industry. So what actually happened? You didn’t go bankrupt, did you? No, but we grew tired of all the messy situations. The video game crash turned the industry into a volatile and shaky place, and after 1985 it became more and more difficult to find contracts that would ensure a healthy income for us. In the end it just got too much, and we just quit sometime around 1987 or 1988. However, we did intend to return to the industry after clear deal standards had been set up and when everything had become a bit more stable. And that hasn’t happened yet? 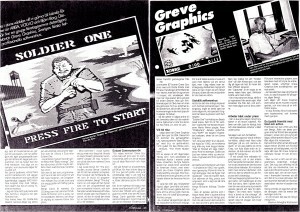 Does Greve Graphics still garner any attention? Yes, I still give lectures about our times at GG, and the large C64 scene in Germany frequently asks me to complete Goremium and finally release Greve Graphics’ last game. So, I guess we’re not completely out of the picture. And who knows; maybe Goremium will actually be completed one day? And finally … is the unreleased game called Goremium or Gorminium? It’s Goremium and nothing else. An old poster from the game Captured evokes happy GG memories. After my discussion with Lars at the small café at Ideon in Lund (the birthplace of Swedish companies such as Ericsson, QlikTech, Axis, and The Astonishing Tribe – and my work place a few days every week) I can’t stop thinking about how it would be to actually release a game C64 today, and if people actually are interested in this. Is the world waiting for Greve Graphics’ last game with baited breath, and would it be cool or just pathetic if it actually was released? During my bus ride I come to the conclusion that it actually would be kind of cool, and that I would like to see and play Goremium someday soon. When I get home I do a quick check online, and since grevegraphics.com and goremium.com are unregistered I send a short e-mail to Lars Hård with this information. He sends me a reply the morning after, from San Francisco where he spends a lot of his time. Lars says that he’s registered the domains, and that our little chat has made him think about Goremium and Greve Graphics’ future. The seed has been planted, and Goremium might actually be completed. Maybe I’ll even play a small part in its release?